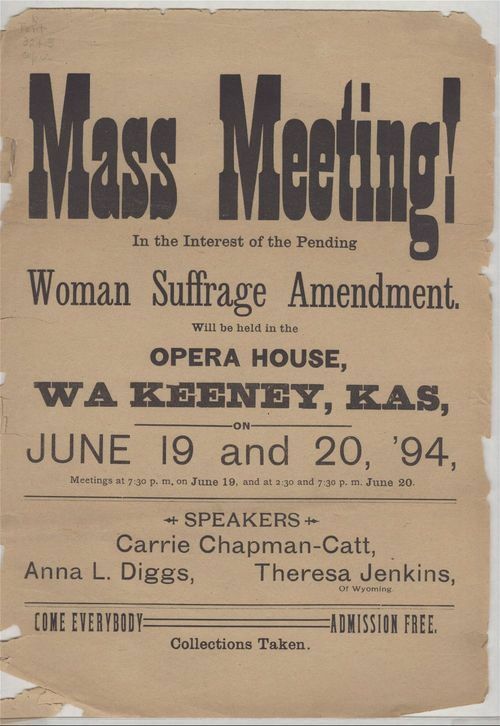 This poster advertises a woman suffrage meeting in Wakeeney, Trego County, to be held on June 19th and 20th, 1894. The speakers were Carrie Chapman-Catt, Annie Diggs (a well-known Populist), and Theresa Jenkins. Women in Kansas did not gain full suffrage until 1912. This is the only poster selected for this standard, and it can serve as an example of how suffrage associations promoted their meetings. It could be paired with the May 1894 article in The Farmer's Wife advertising suffrage meetings across the state.